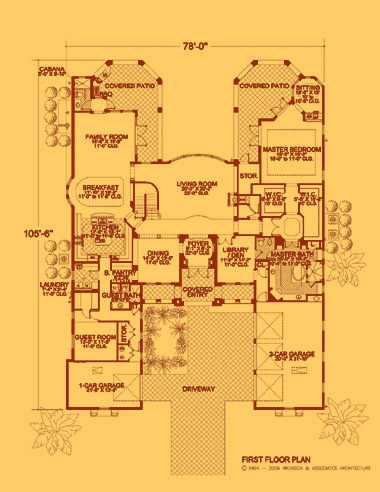 These are a few of our floor plans which can be changed, customized, or redesigned to become your family's HOME. 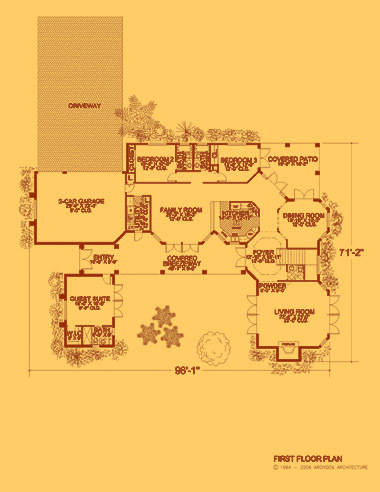 This two-story, Mediterranean-style home features five bedroom, four and one-half bathrooms plus a cabana and two-car garage, offering additional storage space. 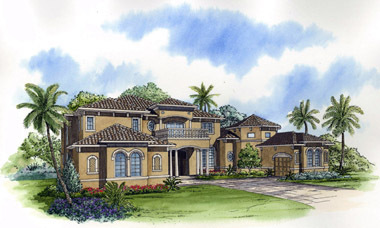 The luxurious exterior has a towering covered entrance, covered balconies, covered terraces with a summer kitchen. The first story has a VIP suite with its own private entrance. There is a residential elevator and a wine cellar to add to the luxurious interior of this home. 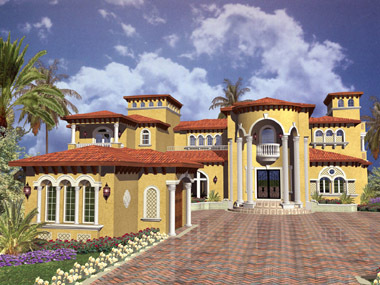 Columns and arches provide strong curb appeal. A huge island kitchen has an eating bar; the butler's pantry opens into the family room. 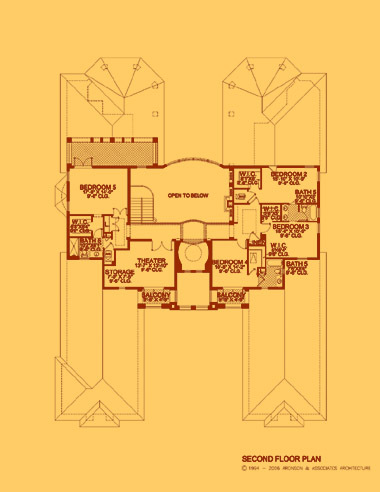 The ultimate master suite dominates an entire wing on the second floor and features enormous walk-in closets with dressing area, exercise room, separate steam and sauna, a morning kitchen, tray ceilings, sitting area, and a luxurious master bath with additional storage areas. This luxurious area opens onto a private balcony. 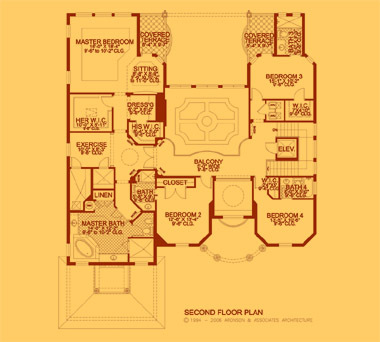 The large living room has a two-story coffered ceiling and features a wet bar and fireplace. Truly a magnificent place to call "home". *Structured wiring for high speed internet connection, room to room computer networking or printer sharing. Perfect for home office or school studies. *Beauitful wood mantels with true slab imported marbel surrounds. *Custom stair-stepped kitchen cabinets with distressed finishes, dual level vanities. 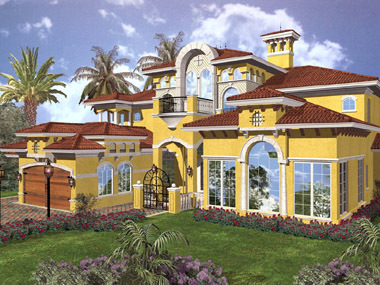 This beautiful, Florida Spanish Mediterranean-style waterfront home features four bedrooms, five and one-half bathrooms, a cabana bath, towering covered entrance with eight-foot high doors and a three-car garage. The columns and arches exude a strong curb appeal. 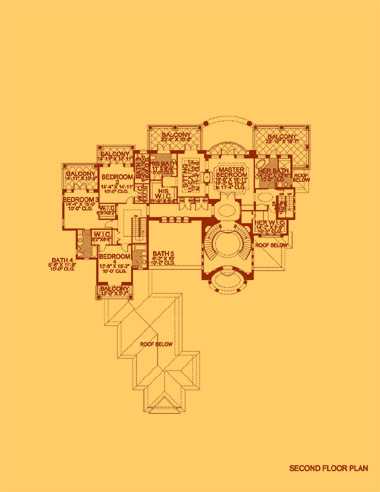 A luxury first story design presents a large living room with two-story ceilings, huge island kitchen with an eating bar and breakfast nook that opens to the family room, a media room complete with a wet bar, cozy library that makes a perfect retreat and a residential elevator. The second story of this magnificent home features a luxurious master suite with large walk-in closets, morning kitchen, tray ceilings and a regal master bathroom opening onto a private balcony. 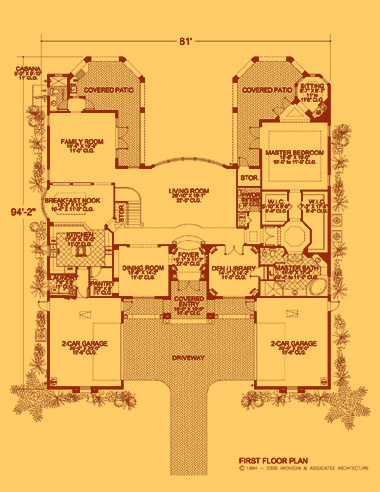 This beautiful, two-story, Florida Mediterranean-style manor offers an enormous amount of living space with six bedrooms, four and one-half bathrooms, a cabana bath, three-car garage, covered entrance with its eight-foot high front door and balconies. 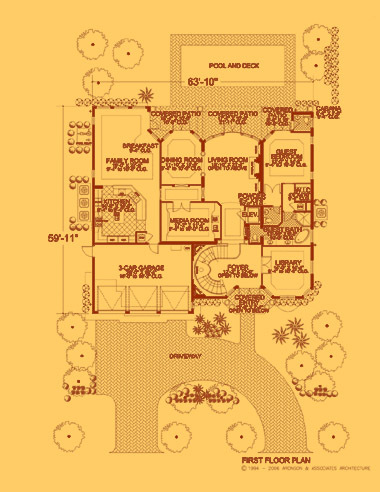 This unique design creates a courtyard to optimize indoor and outdoor living spaces. The family room opens to a patio and into a courtyard. The first story provides a large living room with high ceiling and a fireplace. The designer kitchen features a cook top island, eating bar and pantry. 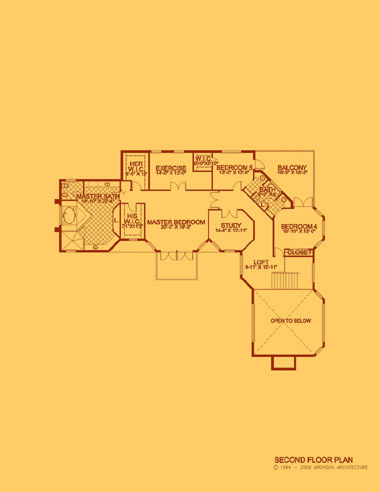 A study is located adjacent to the master suite which makes an ideal place to retreat and relax. 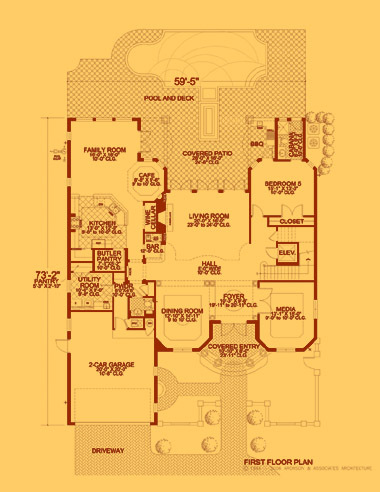 The second story features a luxurious master suite with enormous walk-in closets, tray ceilings and a glorious master bath with adjacent exercise room. This two-story, sprawling Spanish Mediterranean-style waterfront home features four bedrooms, four bathrooms, a cabana bathroom and two and one-half-car garage and offers an enormous amount of living space. Columns and arches provide a majestic appearance. 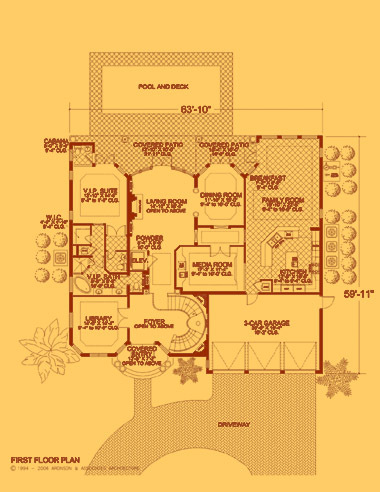 The luxurious exterior has covered balconies and a covered patio with a summer kitchen. Each suite offers the privacy and convenience of a bathroom. A chef's "dream" kitchen features an island, eating bar, breakfast nook with butler's pantry and opens to a large family room. The formal dining room has raised, coffered ceilings. A cozy den provides a place for entertaining or simple solitude. Eight-foot high French doors with arched transom accent the covered entrance. The luxurious first story master suite possesses enormous walk-in closets, tray ceilings with spectacular master bath featuring a walk-through shower. A large central great room with fireplace provides a spacious place to entertain. The large second story media room is designed with a wet bar. 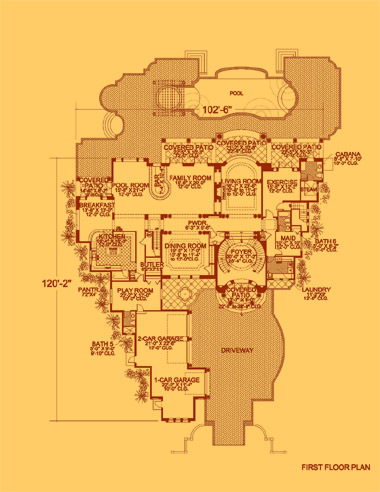 This beautiful, two-story, classic Mediterranean-style residence features five bedrooms, five and one-half bathrooms, a cabana bath, three-car garage, towering covered balconies and entrance with eight-foot high French doors and arched transom. The first story provides a suite with a private entrance. The large living room displays two-story tray ceilings. A huge island kitchen featuring an eating bar opens to a family room. This opulent home has a media room with a wet bar and a billiard room. 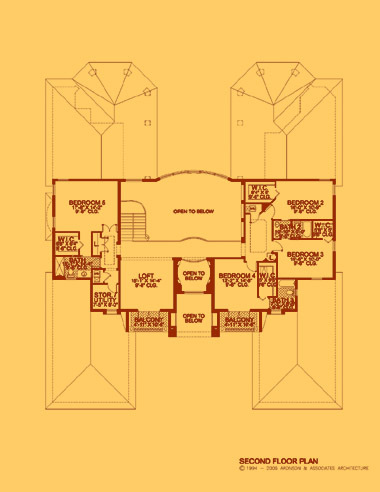 For easy access to the second story, you have the convenience of a residential elevator bringing you to a luxurious master suite featuring large walk-in closets, a morning kitchen, tray ceilings and regal master bathroom which provides additional storage areas and opens to a private balcony. 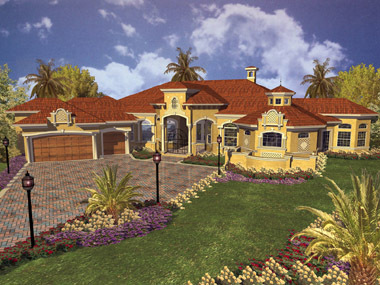 This luxurious, two-story, Mediterranean-style home features five bedrooms, four and one-half bathrooms, a cabana bath and two two-car garages. 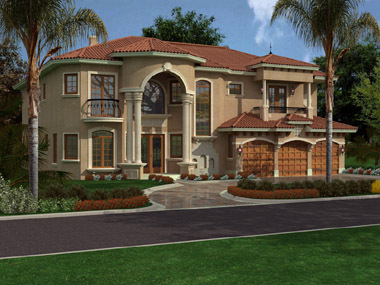 The grand covered entrance and covered balconies add opulence to this home. Exquisite French doors with arched transom accent the entrance. High ceilings and two volume spaces make this design feel "larger than life". A formal foyer invites guests into the living room, flanked by a dining room and den/library. Large covered patios extend outward to create a courtyard. A gourmet island kitchen features an eating bar, breakfast nook and butler's pantry. 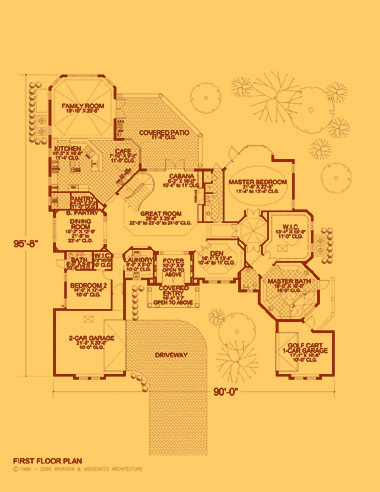 The master suite on the first story has large walk-in closets, a sitting area and private entrance. The large family room opens to a covered patio. 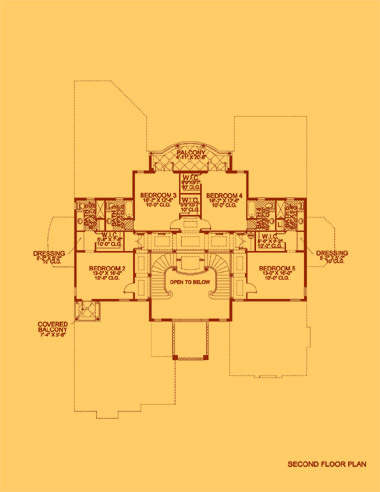 This sprawling, beautiful, two-story, Spanish-style manor offers an enormous amount of living space and amenities; five bedrooms, five bathrooms, a cabana, three-car garage. 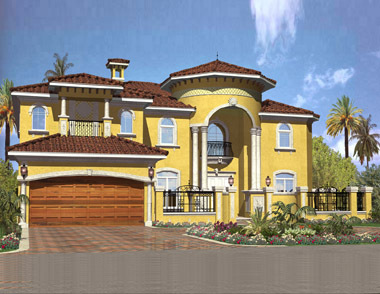 Covered balconies and columns provide a majestic appearance and luxurious interior and exterior to the home. The exquisite arrangement of the covered entry and formal foyer make a dramatic first impression and inviting through a columned vestibule into the family room. The first story features a covered entrance with an eight-foot high French door with arched transom, a large living room with tray ceilings and stately fireplace. A library/den provides a cozy retreat for relaxation or to entertain. A chef's "dream" kitchen with an island, eating bar and breakfast nook opens to the family room. 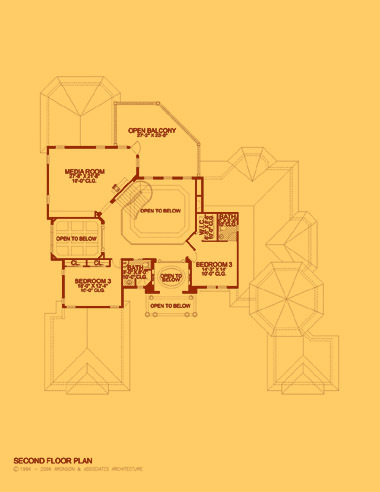 The first story has a luxurious master suite with enormous walk-in closets, morning kitchen, tray ceilings and a regal master bathroom. 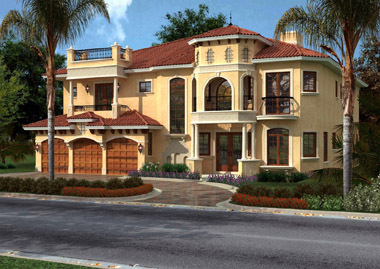 This two-story, Mediterranean-style home features six bedrooms, five bathrooms, a cabana bathroom and four-car garage. The towering, covered entrance displays immense beauty at the exterior. The home theater is a perfect accent for entertaining. Columns and arches provide a strong curb appeal. 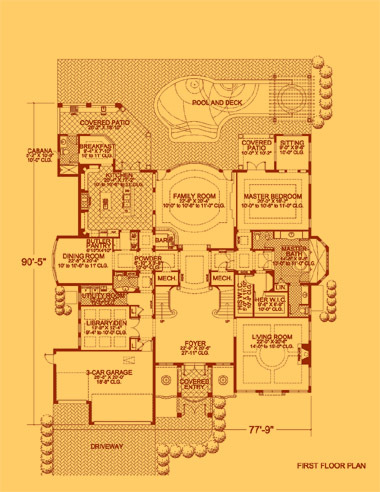 The luxurious master suite features large walk-in closets. The family room is enormous for special times of entertaining large groups. 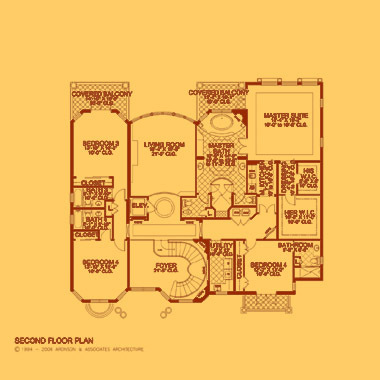 An open foyer invites guests into the living room. The huge kitchen has an eating bar, café and butler’s pantry. This home also features a guest suite. This is a magnificent "castle fit for a king". Pure magic is found in this spectacular "storybook"-style home. 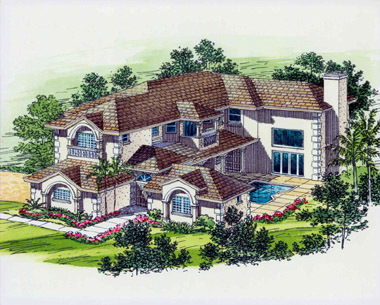 This artistically detailed, three-story, seven bedroom design truly exudes "grandeur". 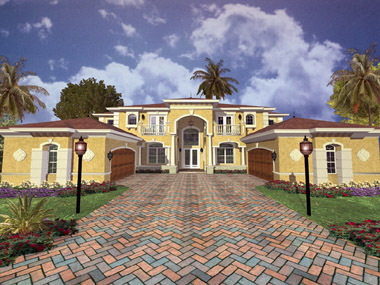 The grand style of this luxurious home brings elegance and grace to perfection. The formal entrance features galleries on both sides and makes a dramatic first impression with marble tile and columns that lead into a large, open living room with a stately fireplace and a twenty-foot high ceiling. The truly majestic and regal master suite features twin French doors that open onto a private, covered balcony. 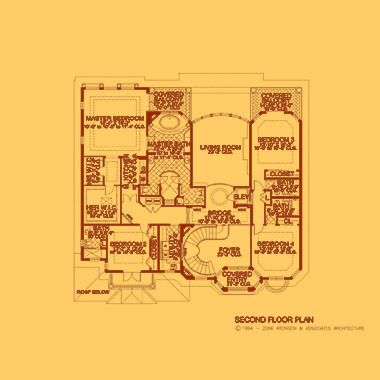 The European-style and compartmentized bath boasts a walk-through shower and spa tub with separate "His and Hers" vanity, lavatories and walk-in closets. The luxury of a private sitting room adjacent to the master suite provides a special place of simple solitude, along with the morning kitchen. All guests will be impressed and feel at home in the luxurious guest suite with sitting area, a spectacular spa bath and French doors leading onto a covered patio. The media room with adjacent morning kitchen serves as a multi-purpose room and a perfect place for casual entertaining or a place to retreat and relax. The enormous, gourmet’s "dream come true" kitchen features an oversized island, coffered ceilings, dual dishwashers and plenty of cabinet space. It opens into a cozy family room and a sunny breakfast nook. There is the convenience of an elevator and every other amenity you can imagine including a wine cellar and library. 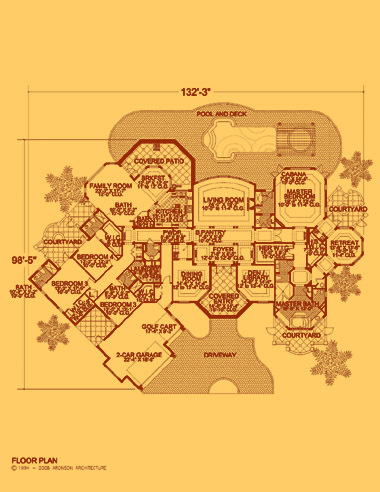 One of the exclusive features of this design is a game room with dormered alcoves located on the third story. A star attraction to this exquisite design is Palladian glass at the rear elevation, immersing the living room in natural light. This house deserves a large lot with a great view. Copyright © 2019 Kavita Purohit, Ph.D. All rights reserved.